If you make a daily pot of coffee, you have a fabulous source of organic matter right at your fingertips. Coffee grounds can make your garden happier in several ways, and not just that coffee gives you more energy for weeding and pruning. Don't toss the grounds. You can put them to work. Put coffee grounds in your compost bin. There are two types of compost material: brown and green. Your coffee grounds may be brown in color, but in compost jargon they are green material, meaning an item that is rich in nitrogen. Coffee grounds are approximately 1.45 percent nitrogen. They also contain magnesium, calcium, potassium, and other trace minerals. Other green compost materials include food scraps and grass clippings. Adding coffee grounds and used paper coffee filters to your compost will provide green compost material. However, it must be balanced with brown compost material, which includes dry leaves and newspapers. There should be a 4-to-1 ratio of brown compost material to green compost material. If you have too much green material your compost pile will start to smell. If you don't have enough, the compost pile won't heat up. 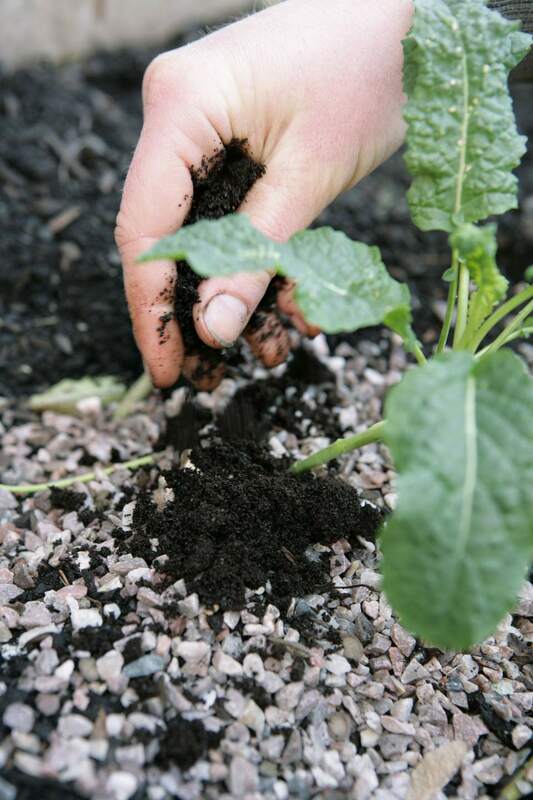 Add coffee grounds directly to the soil in your garden. You can scratch it into the top couple inches of soil, or just sprinkle the grounds on top and leave it alone. In smaller amounts, especially when mixed with dry materials, coffee grounds will give up their nitrogen. Used coffee grounds are actually nearly neutral in pH, so they shouldn't cause concerns about their acidity. You can also make coffee ground "tea." Add 2 cups of used coffee grounds to a 5-gallon bucket of water. Let the "tea" steep for a few hours or overnight. You can use this concoction as a liquid fertilizer for garden and container plants. It also makes a great foliar feed you can spray directly on the leaves and stems of your plants. Add coffee grounds to your worm bin every week or so. Worms love coffee grounds. Just don't add too many at once, because the acidity could bother your worms. A cup or so of grounds per week for a small worm bin is perfect. In addition to using coffee grounds in your worm bin, earthworms in your soil will also be more attracted to your garden when you use them mixed with the soil as fertilizer. Create a slug and snail barrier. Coffee grounds are abrasive, so a barrier of grounds placed near slug-prone plants may just save them from these garden pests. However, be warned that some researchers quibble with this advice and don't think it is effective. You may want to have a backup plan in mind if it doesn't work. Many cats dislike the smell of coffee grounds and may avoid using your garden as a litter box if you mix coffee grounds into the soil. While used coffee grounds are only slightly acidic, fresh (unbrewed) coffee grounds have more acid. Your acid-loving plants like hydrangeas, rhododendrons, azaleas, lily of the valley, blueberries, carrots, and radishes can get a boost from fresh grounds. However, tomatoes do not like fresh coffee grounds; keep them out of that area of the garden. This could be a good use for coffee that is getting old in your pantry or a type you bought for visiting friends but isn't your usual cup of joe. Fresh coffee grounds still have most of their caffeine content as well as the acid. Be cautious in using fresh grounds around pets or your wire terrier may become extremely wired. One research study found that using spent coffee grounds in growing broccoli, leek, radish, viola, and sunflower resulted in poorer growth in all soil types, with or without additional fertilizer. The good news is that the coffee grounds improved the water holding capacity of the soil and decreased weed growth. The researchers think the poorer growth was due to the plant-toxic compounds naturally present in the coffee grounds. If you aren't getting the results you hoped for with coffee grounds, you may want to try your own experiments with and without them in your garden.